Brothers and sisters, President Hunter has requested that I now handle the business of the solemn assembly for which we are met. This is an occasion of great significance for members of The Church of Jesus Christ of Latter-day Saints throughout the world. We shall vote by quorums and groups. Wherever you are, you are invited to stand when requested and express by your uplifted hand whether you choose to sustain those whose names will be put before you. Only those standing should vote at any given time. Following your expression, you may then be seated as indicated. 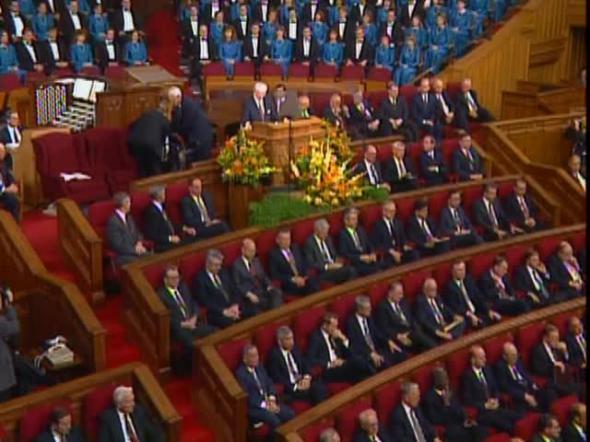 General Authorities assigned to the Assembly Hall on Temple Square or to the Joseph Smith Memorial Building will observe the voting in those gatherings. In stake centers, a member of the stake presidency will observe the voting. And should there be any negative votes, he will advise us. We shall now proceed with the business of this great constituent gathering, which extends to thousands of halls and homes across the world. The First Presidency will please arise. It is proposed that we sustain Howard William Hunter as prophet, seer, and revelator and President of The Church of Jesus Christ of Latter-day Saints. Those in favor, please manifest it. Those opposed may manifest it. It is proposed that we sustain Gordon Bitner Hinckley as First Counselor in the First Presidency of the Church and Thomas Spencer Monson as Second Counselor. Those in favor may manifest it. Any opposed. It is proposed that we sustain Gordon B. Hinckley as President of the Council of the Twelve Apostles and Boyd K. Packer as Acting President of the Council of the Twelve Apostles. Those in favor. Any opposed. It is proposed that we sustain as members of the Council of the Twelve Apostles Boyd K. Packer, L. Tom Perry, David B. Haight, James E. Faust, Neal A. Maxwell, Russell M. Nelson, Dallin H. Oaks, M. Russell Ballard, Joseph B. Wirthlin, Richard G. Scott, Robert D. Hales, and Jeffrey R. Holland. Those in favor, please manifest it. Any opposed. It is proposed that we sustain the Counselors in the First Presidency and the Twelve Apostles as prophets, seers, and revelators. Those in favor, please manifest it. Any opposed. The First Presidency will please be seated. The members of the Council of the Twelve Apostles will please arise. It is proposed that we sustain Howard William Hunter as prophet, seer, and revelator and President of The Church of Jesus Christ of Latter-day Saints, together with his Counselors and members of the Council of the Twelve as they have been presented and voted upon by the First Presidency. All in favor, please manifest it. Any opposed. You may be seated. The members of the First and Second Quorums of the Seventy and the Presiding Bishopric will please arise. It is proposed that we sustain Howard William Hunter as prophet, seer, and revelator and President of The Church of Jesus Christ of Latter-day Saints, together with his Counselors and members of the Council of the Twelve as they have been presented and voted upon by the First Presidency. All in favor, please manifest it. Any opposed. You may be seated. The following will please arise wherever you may be participating. All ordained patriarchs and all members of high priests and elders quorums, please arise. It is proposed that we sustain Howard William Hunter as prophet, seer, and revelator and President of The Church of Jesus Christ of Latter-day Saints, together with his Counselors and members of the Council of the Twelve Apostles as they have been presented and voted upon. All in favor, please manifest it. Any opposed may manifest it. Please be seated. Will all of the Aaronic Priesthood please arise—that is, all ordained priests, teachers, and deacons. It is proposed that we sustain Howard William Hunter as prophet, seer, and revelator and President of The Church of Jesus Christ of Latter-day Saints, together with his Counselors and members of the Council of the Twelve Apostles as previously presented and voted upon. All in favor, please indicate by the uplifted hand. Any opposed. You may now be seated. Will the entire congregation, including all of those who have stood previously, now arise. It is proposed that we sustain Howard William Hunter as prophet, seer, and revelator and President of The Church of Jesus Christ of Latter-day Saints, together with his Counselors and members of the Council of the Twelve Apostles as they have been presented and voted upon. All in favor, please indicate by the uplifted hand. Any who may feel opposed. Thank you. You may be seated. We shall now remain seated as we sustain other General Authorities and general officers of the Church. It is proposed that we sustain as the Presidency of the Quorums of the Seventy Elders Rex D. Pinegar, Carlos E. Asay, Charles Didier, L. Aldin Porter, Joe J. Christensen, Monte J. Brough, and W. Eugene Hansen. As further members of the First Quorum of the Seventy: Loren C. Dunn, Gene R. Cook, William R. Bradford, John H. Groberg, Vaughn J. Featherstone, Dean L. Larsen, Robert E. Wells, James M. Paramore, Hugh W. Pinnock, F. Enzio Busche, Yoshihiko Kikuchi, Ronald E. Poelman, F. Burton Howard, Ted E. Brewerton, Jack H Goaslind, Angel Abrea, John K. Carmack, J. Richard Clarke, Hans B. Ringger, Marlin K. Jensen, Earl C. Tingey, Alexander B. Morrison, L. Lionel Kendrick, Harold G. Hillam, Carlos H. Amado, Ben B. Banks, Spencer J. Condie, Robert K. Dellenbach, Henry B. Eyring, Glenn L. Pace, F. Melvin Hammond, Kenneth Johnson, Lynn A. Mickelsen, Neil L. Andersen, D. Todd Christofferson, Cree-L Kofford, Dennis B. Neuenschwander, Andrew Wayne Peterson, and Cecil O. Samuelson, Jr.
As members of the Second Quorum of the Seventy: Eduardo Ayala, LeGrand R. Curtis, Helvécio Martins, J Ballard Washburn, Durrel A. Woolsey, W. Mack Lawrence, Rulon G. Craven, Joseph C. Muren, Graham W. Doxey, Jorge A. Rojas, Julio E. Dávila, In Sang Han, Stephen D. Nadauld, Sam K. Shimabukuro, Lino Alvarez, Dallas N. Archibald, C. Max Caldwell, Gary J. Coleman, John B. Dickson, John E. Fowler, Jay E. Jensen, Augusto A. Lim, John M. Madsen, V. Dallas Merrell, David E. Sorensen, F. David Stanley, Kwok Yuen Tai, Lowell D. Wood, Claudio R. M. Costa, W. Don Ladd, James O. Mason, Dieter F. Uchtdorf, and Lance B. Wickman. As the Presiding Bishopric: Merrill J. Bateman, as Presiding Bishop; H. David Burton, First Counselor; and Richard C. Edgley, Second Counselor. All in favor, please manifest it. Any who may feel opposed. It is proposed that we extend an official vote of appreciation to Elder Hartman Rector, Jr., and that he be designated an emeritus member of the First Quorum of the Seventy. Those in favor, please manifest it. With gratitude for their service as General Authorities, it is proposed that we release Elders Albert Choules, Jr., Lloyd P. George, Gerald E. Melchin, Malcolm S. Jeppsen, Richard P. Lindsay, Merlin R. Lybbert, and Horacio A. Tenorio as members of the Second Quorum of the Seventy. Those who wish to join in an expression of appreciation, please indicate by the uplifted hand. Elder Clinton L. Cutler was serving as first counselor in the Sunday School general presidency at the time of his passing on April 9, 1994. Those who wish to join in a vote of appreciation for his service and to release with a vote of thanks Elder Merlin R. Lybbert as the Sunday School general president and Elder Ronald E. Poelman as the second counselor in the Sunday School general presidency may do so by the uplifted hand. It is proposed that we release with a vote of thanks and deep appreciation Sisters Michaelene P. Grassli, Betty Jo N. Jepsen, and Ruth B. Wright as the Primary general presidency and Sister Patricia P. Pinegar as second counselor in the Young Women general presidency. We also release all members of the Primary general board. All who wish to join in an expression of profound appreciation to these most faithful sisters for their excellent service may do so by the uplifted hand. It is proposed that we sustain Elders Charles Didier, J Ballard Washburn, and F. Burton Howard as the Sunday School general presidency; Sister Patricia Peterson Pinegar as the new general president of the Primary with Sister Anne Goalen Wirthlin as first counselor and Sister Susan Lillywhite Warner as second counselor; and Sister Bonnie Dansie Parkin as second counselor in the Young Women general presidency. Those in favor may manifest it. Any opposed may express themselves. It is proposed that we sustain the other general officers and board members as presently constituted. All in favor. Any opposed. President Hunter, insofar as I have been able to observe, the voting in the Tabernacle has been unanimous in favor of the proposals made. Any negative votes in any other assemblies will be noted and brought to our attention. Thank you, brothers and sisters, for your sustaining vote and your faith and prayers. We feel that you have sustained us not only with your hands but also with your hearts. We urgently need your prayers and pray that you will continue to offer them in our behalf as your servants. We shall now ask the new Seventies, the new Primary general presidency, and Sister Parkin to take their places on the stand, if you please. Thank you.